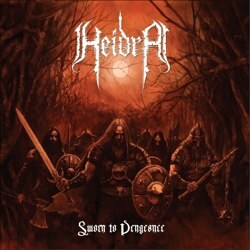 Danish Viking folk black metallers Heidra will release their debut EP “Sworn to Vengeance“. It was to be released on October 1, but due to some unforeseen delays the band had to postpone it a bit. Hopefully it will be ready before the end of this month. This is the first official release of the band, after their 2 demos “The Saga” in 2008 and “Northern Tales” in 2011. “Sworn to Vengeance” will be published by the band as a digipak and it will also become available on iTunes and the like. Info on prices, etc. will be up soon, so you better follow Heidra’s official pages below for more info.